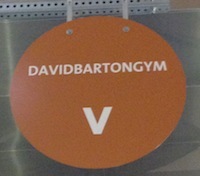 Sometimes you pass by a gym every day and never know what kind of playground hides inside. 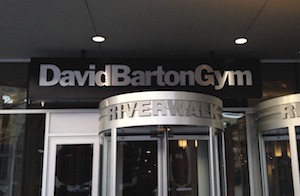 For me, this was David Barton Gym’s in River North before I stopped in for a sweat. Based out of New York, this club-like, artsy-themed gym attracts gym-goers of all sorts. The dimly lit locker rooms were a little hard to get around in. But once I stepped onto the weight room floor I saw what a fabulous gym DBG is! The variety of weight and cardio machines definitely peaked my muscle interest. And the view of the Chicago river from the cardio deck was a nice change of pace from a cement wall behind the row of TVs. As I perused the floor, I found my place in the main studio for Richard’s Rapid Fire interval-training class. Since classes here are taught by the personal training staff, I was curious to see how different the style would be to that of a fitness instructor. Enter Richard. Fierce, full of muscles and of little words other than “Ok? Go!” This class was intense. Not wasting any time, Richard had us dive right into burpees with weights, up and overs across a step, push-ups for days and many-many crunches. The class flew by, yet left me sore and wanting to come back for more! Richard has options so I can safely recommend this workout to all fitness levels!